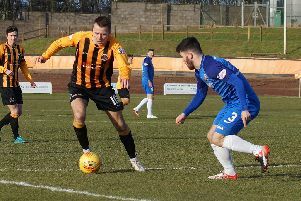 Berwick manager Johnny Harvey was in jubilant mood after watching his side pick ups their first back to back league victories in two seasons at the weekend. 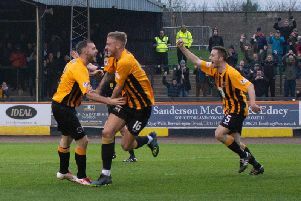 The 2-0 home win over Albion Rovers followed on from a 4-2 away success as Elgin the previous week and Harvey said: “It wasn’t a vintage performance, but we will take the three points. “We only had ten first team players available to us with nine call-offs, so it wasn’t easy. “But after the Elgin game last week that’s back to back victories for the first time in a long while, and I couldn’t be happier. With only five points separating the two sides at the bottom of Scottish League 2 before kick-off this was a battle of the basement. But it was Rangers who emerged triumphant with a first half goal from Daryl Healy and a second half penalty from Paul Willis helping the Borderers open up an eight point gap over their opponents, and leapfrog over Stirling Albion into eighth. For the second week running Berwick took to the field with two trialists in their starting XI. Albion started the brighter of the two sides and in the first minute Lewis McLear broke down the right and fired across the face of the goal for the visitors. Jamie Watson also had a free kick safely collected by Sean Brennan. It took Rangers 27 minutes to carve out an opening when a Gary Phillips free kick was met by Aaron Murrell with a glancing header, but the effort was straight at Rovers’ keeper Daniel Potts. Daryl Healy then hit a half volley over the top from outside the box after the ball was headed down to him by Murrell. At the other end Watson shot straight at Brennan when Albion broke from their own half. But the deadlock was broken after 33 minutes when Healy poked home from close range in a crowded goalmouth after Jack Cook headed down into the ground and onto the crossbar from a corner. Straight from the re-start in the second half Albion got themselves into all sorts of trouble at the back and Phillips almost got in, but a defender made a last ditch clearance. On 64 minutes Berwick created a good opening when Paul Willis broke down the right and crossed for Healy who headed straight at Potts. A minute later, Declan O’Kane was fouled by Potts in the box and Willis converted from the penalty spot to double Rangers’ advantage. Albion tried to respond with Lewis Wilson having a shot deflected narrowly wide for a corner following a goalmouth scramble and following a good build-up through the middle McLear saw a first time shot well saved by Brennan. Near the end Berwick might have added a third when Potts parried a shot from distance but the on-rushing Ogilvie was unable to keep the rebound down. “We are moving in the right direction,” said Harvey, “and that’s the important thing at this stage of the season.